For June 2015, OSHA reported 1,087 inspections conducted in Region IV, which encompasses Kentucky, Tennessee, North Carolina, South Carolina, Mississippi, Alabama, Georgia, and Florida. Programmed/Planned: These inspections are typically aimed at industries identified by OSHA as specific high-hazard industries, workplaces, occupations, or health substances, or other industries identified in OSHA‚ current inspection procedures. OSHA selects industries for inspection on the basis of factors such as the injury incidence rates, previous citation history, employee exposure to toxic substances, or random selection. OSHA develops special emphasis programs that are local, regional, or national in scope, depending on the distribution of the workplaces involved. Programmed inspections may take place because the employer appears on a list created by OSHA relating to an emphasis program it has undertaken, including National Emphasis Programs (e.g., fall protection, chemical issues (PSM-related processes));. 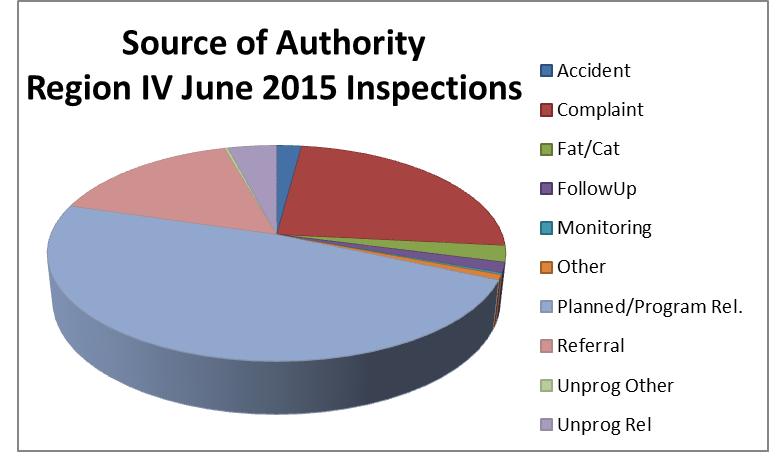 Follow-up: A follow-up inspection determines if the employer has corrected previously cited violations. If an employer has failed to abate a violation, they will be subject to Failure to Abate violations, which may involve proposed additional DAILY penalties until the employer corrects the violation. 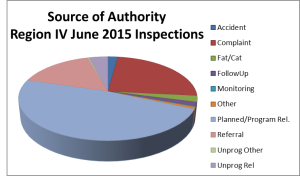 Please see the chart below which demonstrates that, consistent with OSHA‚ current enforcement priorities, most of OSHA‚ Region IV inspections in June 2015 were planned/program related. 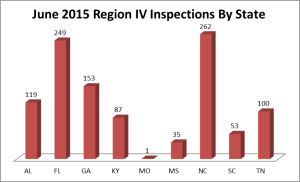 If your worksite is inspected, OSHA will generally issue citations from any given inspection within six (6) months from the beginning of the inspection. In federal OSHA plan states, you only have 15 working days to contest the citation, including the proposed penalties and abatement periods set forth therein, from once it is received. If you participate in an informal settlement conference, this participation may not toll the time in which you must issue a notice of contest. If a timely notice of contest is not provided, you may lose your right to contest the proposed citations, including the attendant penalties and abatement periods. Once your notice of contest is received, OSHA or its state-plan equivalent will initiate the prosecution of the proposed OSHA citations by filing a complaint against your company. We invite you to contact Tom Ullrich or Derek Brostek with any questions you may have regarding the OSHA citation defense process.